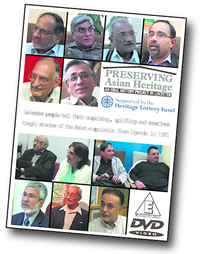 This is part of the East Midlands Economic Network website and highlights a DVD telling the stories of Asians who were expelled from Uganda in the 1970s and settled in the UK. Research, interviews, filming and DVD production were carried out by a team of enthusiastic volunteers from Leicester. The people interviewed lived in the Leicester and Birmingham areas when the film was made. The project is aimed not only at young British Asians, but at the whole community. Examples of interviews can be seen on the East Midlands Economic Network website.